This book is about true stories of young entrepreneurs in Indonesia: how they started, what inspired them and where they are now. 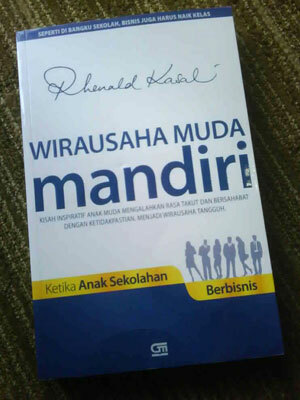 Written by a famous educator, motivator, Prof. Dr. Rhenald Kasali, you can get the copy at any bookstores now. When a friend of mine called and congratulated me, I was pretty clueless. I didn’t know that Rhenald included my story (page 126). No complain though. I feel honored. – Give the very best of your quality. Never think that people buy your image or brand. – Limit our products. Quality products are not mass products. – Be consistent on pricing. Your price shows your quality. – Give credence. It’s the symbol of trust. – Always stay ahead. Your credibility is your challenge.